Q: What time are the webinar calls? Q: How do I reset my account password? Q: How do I navigate around the membership site? Where are the monthly teaching videos and recorded live calls? First, click on the module you would like to view by selecting “View Product”. This will take you to the main place where all the monthly teachings and live webinar recordings are stored. Simply hover over the month tab you are trying to view to select “Teachings” or “Live Webinars”. All content in that category will appear on the left side, including any materials you are able to download. Q: I am having odd display or compatibility issues. How can I fix this? Make sure to use the latest version of Firefox, Chrome, or Safari and make sure all of your computer updates are installed. DO NOT use Internet Explorer.Q: How do I clear my browser’s cache? Q: How do I watch the live webinars? You will get an email from “Tech Support” one week, one day, and one hour before each call. 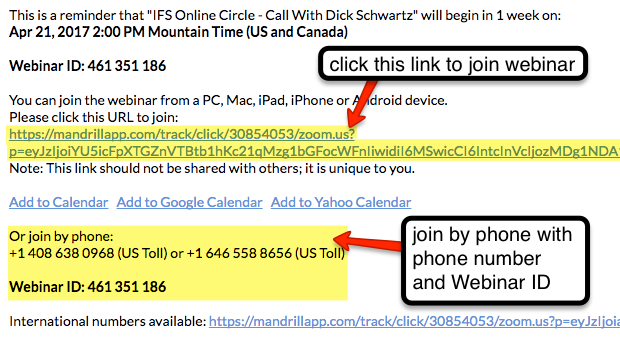 Simply click on the link in the email to join the call, or follow the instructions to join by phone. Click here for Zoom’s instructions on viewing webinars. Q: If I miss the call, when can I listen again? We understand you have busy schedules and lives in many different time zones, so all the calls will be recorded and transcribed so you can listen to them anytime, as many times as you like. You will also be able to download the calls. The calls are uploaded into the membership site, usually within 2 business days. Q: How long will I have access to the course content on the membership site? The content will be available as long as you are a member of the IFS Continuity Program. You may download the content to your computer (see “Downloads” on the left column of each video) if you would like to save the material indefinitely. 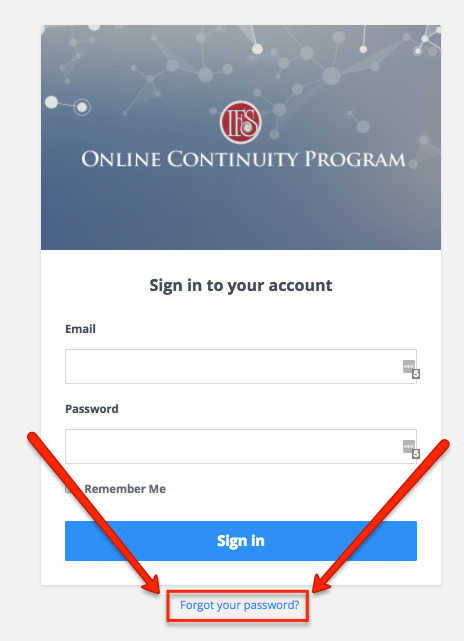 Q: I signed up for IFS Continuity Program but did not receive access to the Membership Site. Your membership information email most likely landed in your spam folder. If you did not receive the email with access to your account please check your spam folder. If you could not find your invite email, you can request a new password – click on the link below and use the email address you used to register. If this still doesn’t work, please contact us at help@ifscircle.com. Q: Can I get CEs for this program? Jointly sponsored by Commonwealth Educational Seminars, we have 15 CEs pending approval for each 4-month module of on-line learning. Click here for more information on Continuing Education credits. If you don’t see the answer to your question here, contact us at help@ifscircle.com. Our team aspires to provide exceptional customer service in a timely manner. We answer emails on business days. This allows our team time with family and friends on non-business days. When contacting us by email, please expect a response within one business day. When contacting us through social media, please expect a response with two business days. If your question requires an expedited response, please contact us through help@ifscircle.com. We appreciate your feedback. If you believe there is something we could be doing better, please use this survey to let us know.